As I prepare for the Disney Social Media Moms celebration, I’ve been thinking of the various dads in the world of DIsney. While there are many, one recent one stands out to me: Doc McStuffins’ dad. 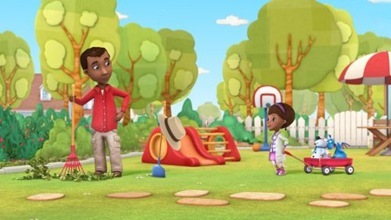 Doc McStuffins is a story about a very special little girl. She wants to be a doctor when she grows up and gets plenty of practice by fixing toys. She doesn’t simply patch up toys, though. Thanks to her magical stethoscope, her toys come alive. They can walk, talk, and cuddle. Doc’s mother is a doctor and provides much of Doc’s inspiration, but I’d like to focus on her father. Too many times, dads on television are portrayed as dim-witted and/or unwilling to have a close relationship with their children. Doc’s dad is neither of these. He’s a stay-at-home dad that does the gardening and cooking. He might not be a doctor, but he’s intelligent and loves his kids. Whether he’s taking Doc and her brother out on a camping trip, or recognizing that Doc’s brother (who stayed up late one night) needed a nap, he provides a great Dad role-model for kids. He might not be center stage, but then again, neither is Doc’s mom. The main attraction is Doc and her toys. Doc’s dad is always in the background, though, ready to lend a Doc a helping hand if she needs it. Disclaimer: The image above is courtesy of Disney. The opinions, however, are all my own.